They locked up mob boss Paul Vitti (Robert DeNiro) in Sing Sing and that's where he sang sang - bellowing West Side Story tunes and convincing official he's more suited for a nut house than the Big House. Better yet, the Feds say, let's release Vitti into the custody of his therapist Ben Sobel (Billy Crystal). Opening weekend $11.034 million on 2635 screens. When we look back at the movies released during the big holiday season of 2002, it seems to me that three high-profile duds emerge: Treasure Planet, Star Trek: Nemesis, and Analyze That. All received a fair amount of hype and had high expectations that they’d achieve box office success, and all fell flat in the latter regard; each of the three earned between $32 million and $43 million in the US. However, at least Nemesis and Planet seemed likely to do much better on home video. The Star Trek franchise always performs well in that realm, as do Disney products. The future appeared less certain for That, which didn’t have the same built-in audience ready to grab it on DVD. Based on the quality of the movie, I certainly doubt that it’ll develop any word of mouth campaign to make That a home video hit. The sequel to 1999’s Analyze This, the film starts with Paul Vitti (Robert De Niro), the crime boss from the prior flick, in jail. Almost due for potential parole, someone’s out to kill him, and he nearly gets whacked in bed. In the meantime, Vitti’s therapist from the earlier film, Dr. Ben Sobel (Billy Crystal), deals with the death of his father, a man Ben didn’t much like. Nonetheless, he tries to work through his various issues, a factor complicated when Vitti calls him at the elder Sobel’s funeral. Vitti warns Sobel that nasties want to off him, but Ben angrily blows off the call. This attracts the attention of the FBI, who monitor all of Vitti’s communications. Soon after that, Vitti experiences an apparent mental breakdown; he goes between manic periods in which he sings showtunes from West Side Story and a catatonic state. Sobel suspects that Vitti’s faking it, but the mobster “passes” all his psychological tests, so Ben endorses the notion of Paul’s temporary mental illness. He recommends that Vitti won’t get better if he remains in the joint, so against his will, he agrees to take Paul into his home for treatment. Vitti quickly admits that he fooled Sobel, and after some angry words, the pair work on Vitti’s new life. Paul needs to settle some gang scores and find out who’s trying to kill him. Sobel attempts to get Vitti to go straight, so the gangster attempts a series of non-criminal job. This culminates in his job as a technical consultant on a mob-based TV series called Little Caesar, and the rest of the film follows these threads. I liked Analyze This but can’t say I really enjoyed it. After I screened That, I watched This again so I could update my almost four-year-old review. Compared to That, This presents comic gold. Never did I appreciate the 1999 film so much until I had to sit through this clunker of a sequel. To be fair, I can’t call That an atrocious piece of work. It just seems unnecessary and pointless, and it offers very little entertainment. It’s cool in an inside joke way to see De Niro interact with Cathy Moriarty-Gentile, his old Raging Bull co-star. In addition, as one who administers such tests, the scenes with the psychological eval amused me, especially when De Niro offered some funny answers. Otherwise, That simply falls flat. De Niro and Crystal interacted nicely and showed some spark during the first flick, but here they often seem distanced and detached. Part of that may stem from the fact that the sequel concentrates much too heavily on Vitti. The original movie split time between them fairly well and actually accentuated Sobel more heavily. Here he feels like an afterthought. People responded positively to the De Niro scenes in This, so I figure the filmmakers decided to give the people what they want, and they stuffed in a Vitti-heavy storyline. Unfortunately, the character works better when he contrasts against the milquetoast Sobel; without that opposition, Vitti feels like little more than any other movie mobster. Since I don’t much like Crystal, I never thought I’d write this, but That needed more of his character to succeed. The inclusion of the Little Caesar elements probably sounded good on paper, as it offered an obvious spoof of The Sopranos. However, in reality, it comes across like little more than a gimmick. And it’s a fairly witless one at that, as the film never offers any form of incisive mockery of The Sopranos; whatever reaction it gets comes strictly from recognition value. I’ve enjoyed most of director Harold Ramis’ flicks, and find that even the weaker ones have some very good moments. That trend didn’t continue for the bland and humorless Analyze That. The sequel came across as a pointless exercise in filmmaking that provides almost no laughs and barely musters a recognizable plot. I can’t say that I actively dislike the movie, for it’s not substantial enough to merit such passion. Instead chalk up That as a dull disappointment. 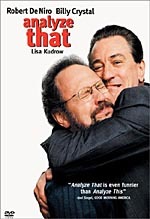 Analyze That appears in an aspect ratio of approximately 1.85:1 on this single-sided, double-layered DVD; the image has been enhanced for 16X9 televisions. As one expects from a recent “A”-level flick, the picture consistently looked positive. No issues related to sharpness manifested themselves during That. The image remained crisp and well defined at all times. If any examples of softness interfered, they escaped me. I witnessed no issues connected to jagged edges or shimmering either, but a smidgen of edge enhancement appeared on occasion. Print flaws also remained minor. I saw some light grain and a few small marks, but nothing substantial interfered with the presentation. That featured a warm and natural palette that looked fine. The colors seemed vibrant and distinctive, and they really came across wonderfully much of the time. Black levels appeared similarly deep and rich, and shadow detail usually remained more than acceptable. A few low-light shots were slightly murky, but those instances occurred infrequently. 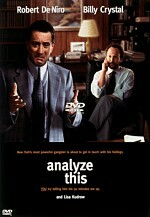 Overall, the image of Analyze That seemed like a success. I didn’t feel as pleased with the Dolby Digital 5.1 soundtrack of Analyze That. While the first film presented a surprisingly involving mix, this one seemed lackluster. The soundfield mostly just accentuated light ambience. Music showed good stereo imaging, and effects spread naturally if gently across the forward speakers. More active environments like restaurants or strip clubs brought some life to the track, and a car chase single-handedly kept my grade from “C” territory; it offered the film’ most significant action sequence. Otherwise, the surrounds and sides didn’t get a lot to do. Audio quality seemed generally positive. Speech occasionally sounded somewhat stiff and tinny, but the lines remained intelligible and without serious defects. Louder effects demonstrated slightly harsh qualities, but these also didn’t really interfere with the presentation, and those elements generally came across as realistic and fairly full. Music also seemed unexceptional but acceptably bright and dynamic. Bass response was good but not much more than that. As I alluded, my grade teetered between a “C+” and a “B-“. I went with the higher grade, but don’t expect much from this bland soundtrack. 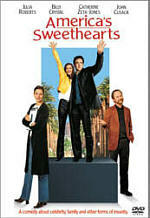 The DVD of Analyze That tosses in a few extras. We start with an audio commentary from director Harold Ramis, who provides a running, screen-specific affair. Ramis has recorded tracks for a number of other films, most of them solo efforts like this. Fans who’ve heard any of those other commentaries will know exactly what to expect from this highly spotty piece. On the positive side, Ramis shows little ego and he happily points out little silly elements of the movie like the fact that filmmakers remove the rear view mirrors from the cars. He also adds some notes about working with the actors and the creative process, with an emphasis on how the script evolved and what material he kept or cut. However, the commentary really drags at times. Ramis allows much of the film to pass without any information, and when he does speak, he often simply relates the names of locations or actors. Ramis includes enough interesting remarks to make this commentary at least sporadically successful, but it remains slow going and frustrating. Next we find an HBO “First Look” special cleverly entitled The Making of Analyze That. Like virtually every other example of this genre, the 11-minute and 20-second program offers movie snippets, material from the set, and interviews. We get remarks from director Ramis, actors Robert De Niro, Billy Crystal, and Lisa Kudrow, and producers Jane Rosenthal and Paula Weinstein. The show offers scads of film clips, some puffy talk from the participants, and little else. Even the outtakes repeat those found at the flick’s end. There’s almost nothing of value in this insubstantial piece; it definitely doesn’t give us any sense of how they made the film. M.A.D.E. stands for “Mafioso Associate Degree Exam”, an “interactive challenge”. You answer a series of cutesy mob-related questions and then get your score that indicates your standing in the Mafia. It’s fun once but that’s about it. Cast & Crew includes filmographies for actors De Niro, Billy Crystal, Lisa Kudrow, Joe Vitterelli and Cathy Moriarty-Gentile plus co-writer Peter Steinfeld and co-writer/director Harold Ramis. The DVD concludes with the film’s theatrical trailer. 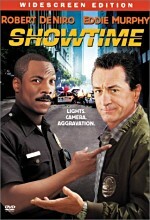 I liked Analyze This and figured Analyze That would provide a similarly slight but amusing experience. Unfortunately, it satisfies the former but not the latter. It includes very few laughs and it seems like nothing more than a dull opportunity to try to cash in on the success of the first flick. The DVD presents very good picture quality with fairly mediocre sound and a generally blah set of supplements. If you liked Analyze That, you’ll probably feel at least moderately content with this DVD. Otherwise, I have to steer you away from this limp and unfunny comedy.